Hialeah, Florida is a large, hispanic-majority city of 200,000 residents located just 10 miles from downtown Miami. With a history in silent movie-making and horse racing at storied Hialeah Park, Hialeah’s role in Cuban immigration has solidified its place as a working class, affordable suburb today. With a 92% hispanic/latino population, Hialeah has the second-highest amount of Cuban and Cuban-American residents in the country. In addition, 92% of residents also report speaking spanish as their first language. Hialeah’s demographics today are a direct result of Fidel Castro’s rise to power in Cuba in 1959. Following then, several waves of Cuban exiles – continuing through the 1990s – created what one historian has called an “…affordable Eden”, as well as “…a place where different groups have left their imprint while trying to create a sample of what life should be like.” Hialeah today is considered one of the most economically successful immigrant enclaves in the country, and one of the only industrial cities poised for economic growth. 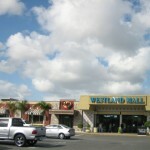 Hialeah’s mall, Westland Mall, is located on the west side of the city along Palmetto Expressway (FL 826) at the intersection of 49th Street (FL 932). 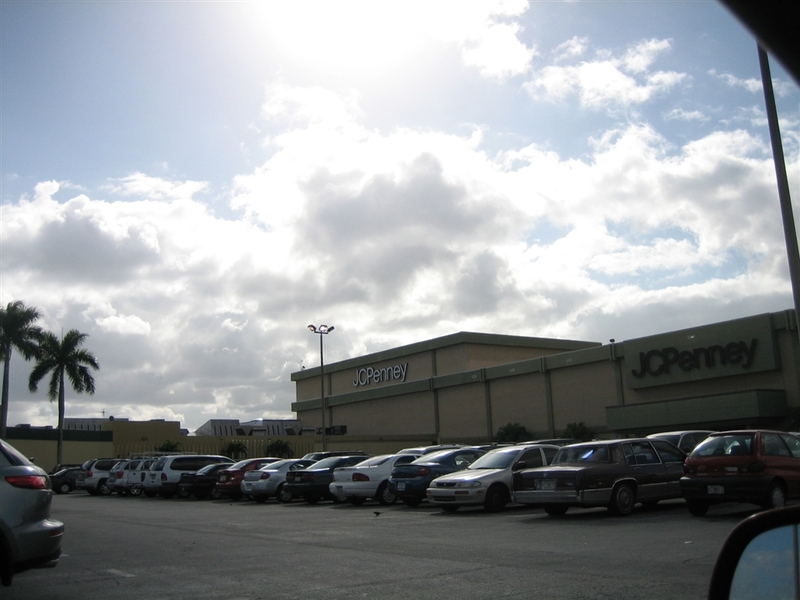 It opened in the summer of 1971, expanding upon an already-extant Burdine’s store, adding JCPenney as a middle anchor, and Sears on the other end with an enclosed mall of stores connecting them. 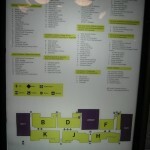 The layout of the mall is a simple dumbbell, and has remained largely unchanged since Westland first opened 38 years ago. 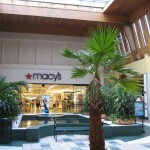 In fact, the only large-scale cosmetic changes to the mall have been the addition of a food court, partial renovations – such as flooring, and the changing of Burdines to Macys in 2005. As of January 2007, the alternating wood-paneled ceiling remained, as well as the unique skylight windows. Are they still there? 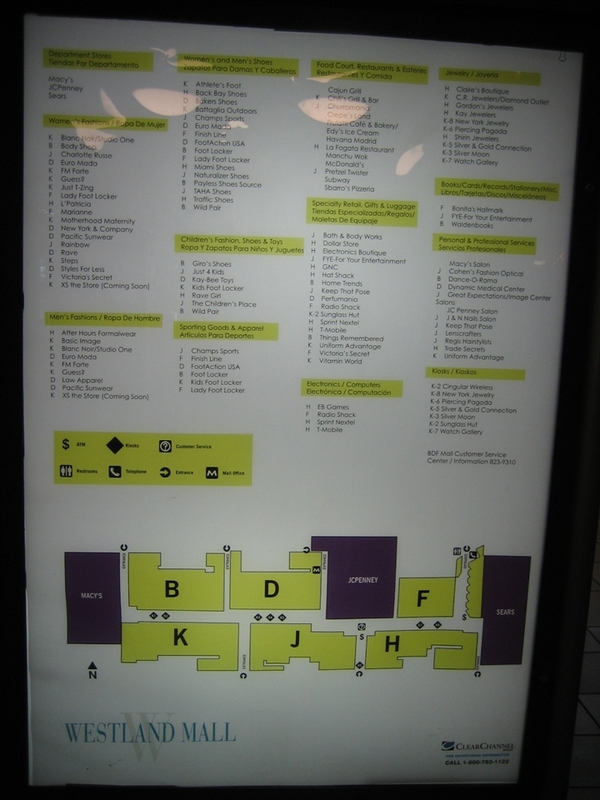 Overall, these features were by far the most interesting features of this mall. 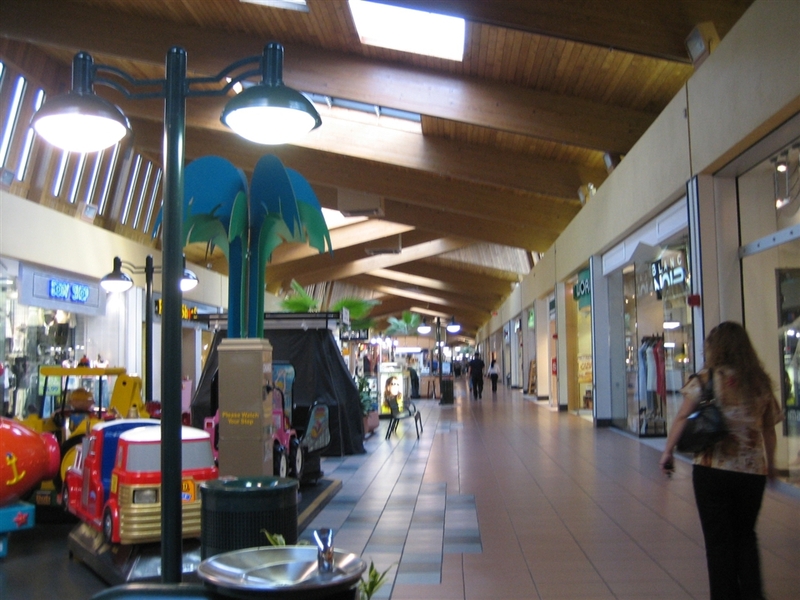 Although demographics informs some of the tenets of the mall – such as spanish signage and hispanic/latin restaurants – many of the mall’s tenants and atmosphere in general are your typical run-of-the-mill mid-tier mall stores, such as Lens Crafters, Victoria’s Secret, and Pac Sun. Another change at Westland Mall recently was a change in ownership. Previously owned by the Mills Corporation, Westland was unloaded to Westfield America in 2007 after Mills was sold to Simon and Simon ostensibly didn’t want it. 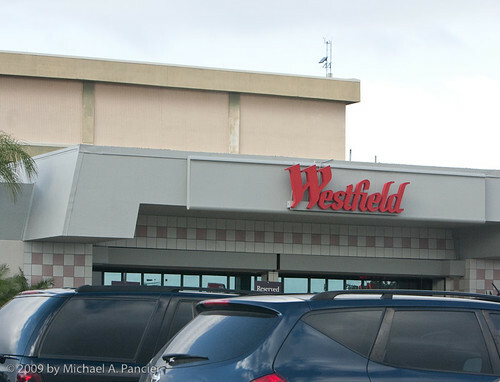 Immediately following acquisition, Westfield technically “renamed” the mall to “Westland Westfield” – but we’ll pretend that didn’t happen, at least in official recognition (see the title). It’s not like we have any major beef with Westfield, they’re a fine operator – but to rename every mall with a brand? Too much. The pictures featured here were taken in January 2007. 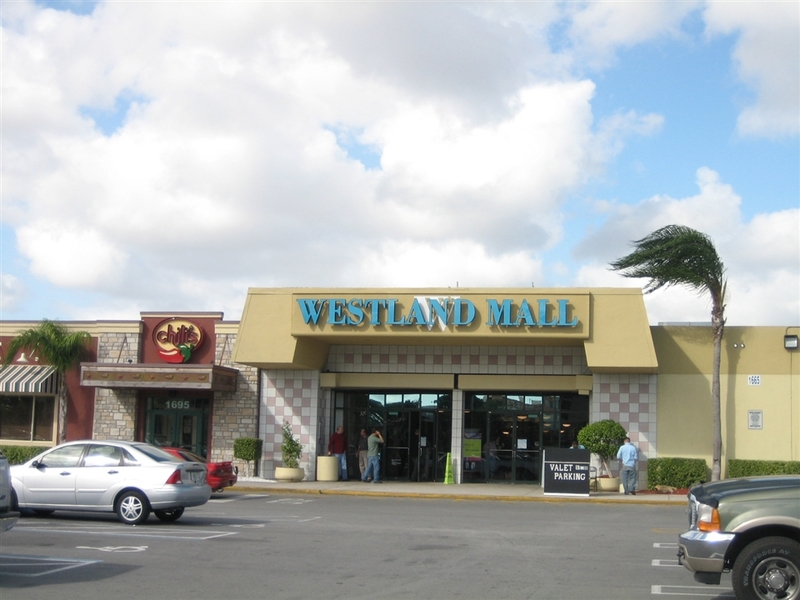 As usual, feel free to leave your own comments and experiences with Westland Mall. That early 90’s green/peach really fights with the 70’s architecture. A new floor + some new light fixtures would make it retro-chic. I believe the mall is also a Westfield now… so it’s probably Westfield Westland or some botched name. It seems to have a roster of quality national and regional chains. It probably makes a great alternative to the higher end regional shopping centers of South Florida. Amazing vaulted, wooden-plank filled ceilings! Wow! This seems to be a well kept mall with a lot of national retailers and some independents thrown in. 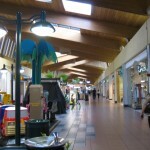 If the mall’s ever renovated, I think they should keep the wooden ceilings, it’s unique and makes the mall more cozy. I really like that mall, period. The Burdine’s store is pure 60’s and quite attractive for 60’s too. If only they’d make earthtone flooring to match the ceiling, adding a few planters and (gasp) a fountain it would be a perfect specimen. It’s definitely got the Florida touch with that aqua sign on the outside. I hope they don’t change it with that stupid tongue-twisting Westfield Westland Mall. @JT, the sign has been replaced but Westfield did keep from that annoying tongue-twister. My bad, it DOES have fountains and planters. Okay, flooring is a simple fix LOL. Unfortunately, this may be a “bad Westfield”. Northwest Plaza and Crestwood Plaza suffered similar fates…the buildings were never redone and stores bled faster out of there than ever. Not nessessarily defending Westfield here, but aren’t NWP & Crestwood also a product of the St Louis economy? After all the metro area has had retail problems well before the two malls started faltering. Sean, Northwest Plaza died because of a collection of non-emphathized traits: crime problems, demographic shifts, competition, and management incompetence. Crestwood died because it was mostly too close to St. Louis Galleria. @SEAN, The “retail problems” in St. Louis have less to do with the economy at large than demographic shifts and competition as Jonah pointed out. Northwest Plaza was felled by white flight, a perception of crime, poor management, and competition from nearby malls like St. Louis Mills. Also, keep in mind St. Louis was overmalled, so any mall that doesn’t continuously expand/renovate/upscale is going to be left behind. 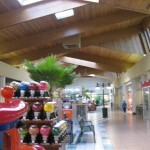 Similarly, Crestwood – while poised in a relatively good location – was felled by competition from upscale-leaning West County Center, which was totally reconstructed in 2002, and St. Louis Galleria, as well as the aggressive renovation and expansion at South County Center a few years ago. Why am I talking about this on a post about Miami? I think this mall does fine as a B-tier regional center for Hialeah. People aren’t going to travel to this one from all over South Florida like they would for Sawgrass Mills, Aventura, Dadeland, or the tri-fecta of malls by the airport, but it does way better than Crestwood and NW Plaza and I think it has a ways to go before it meets their fates. Thanks guys for that explamation. Now along those lines can we say the Miami Palm Beach Metro area is also over malled as well? We already discussed PBM at great length, but that example semes to be repeating it self here. The criticle difference is PBM lost it’s nitch while this mall found there’s & finding a way to make it work for them. Lets see if other malls follow that example & try to really understant the nitch they are in & become successful at it. I was born and raised in South Florida, so I can probably give some better insight to the above comment stream. The South Florida Metropolitan Statistical Area is hugely over-malled, SEAN. Nearly every individual municipality has their own mall, and frequently, several variants of shooping center concepts, from the strip mall, to the “traditional” enclosed mall (I use the quotes because a way of retailing that’s less than 100 years old is hardly “traditional,”), half-arsed lifestyle centers, full-on lifestyle centers, and complete New Urban Fake Downtowns. 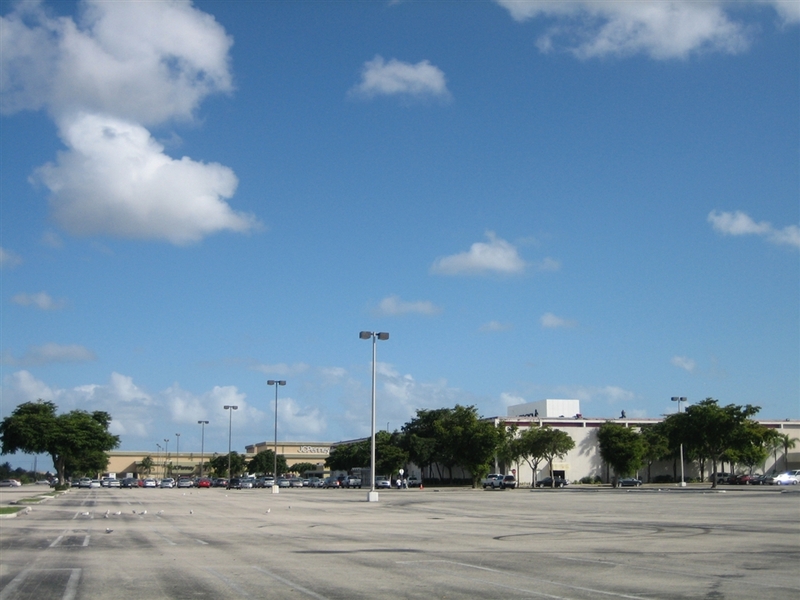 Needless to say, this overbuilding of malls in South Florida will certainly result in the closing of some of them…and as a former resident of FloriDUHH, I say good riddance! Not because I don’t like malls (I do, sometimes,) nor commerce (love shopping,) but because they insanely overbuilt their retail capacity, by many mall-ions of square feet. Having said that, there are some really beautiful and astonishing malls in South Florida that I’m surprised haven’t been covered on this site. 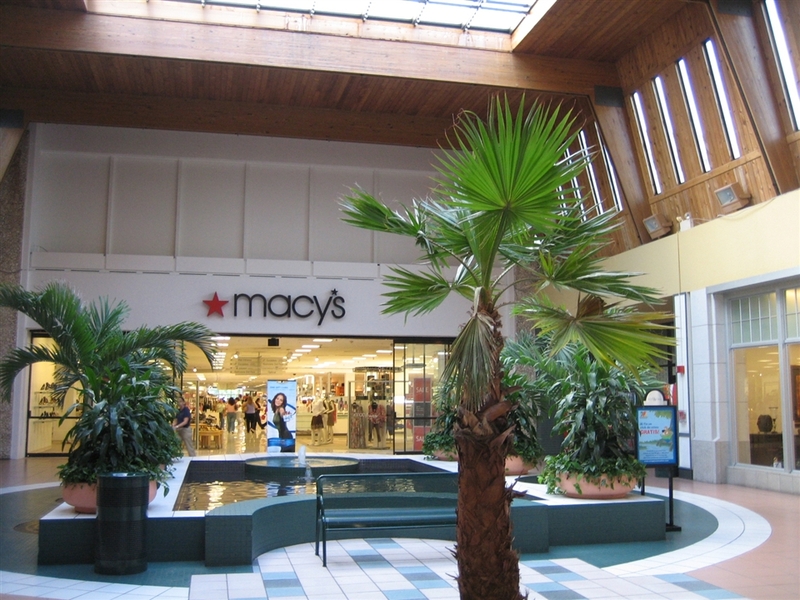 Dadeland essentially inspired the suburb of Kendall, and also inspired an entire “fake downtown” right next door (and the Burdines/Macys there was, at one time, the most profitable store per square foot in the country.) The Fashion Mall at Plantation, while mos def a “Dead Mall,” is an architectural modern masterpiece. And so on and so forth. I have family in that area of Florida or is it Flori-duh, in this case. I haven’t been there since 1989 & even I noticed there semed to be a mall every mile or two along US 1, Biscane Blvd or some other highway in the try-county area. Going a step beyond that, in 1995 the Aventura area 33180 became it’s own city just like Cherry Hill NJ did in the early 60s. @Aaron, I LOVED the Fashion Mall. It was simply BEAUTIFUL! 3 stories, 2 fabulous dept. 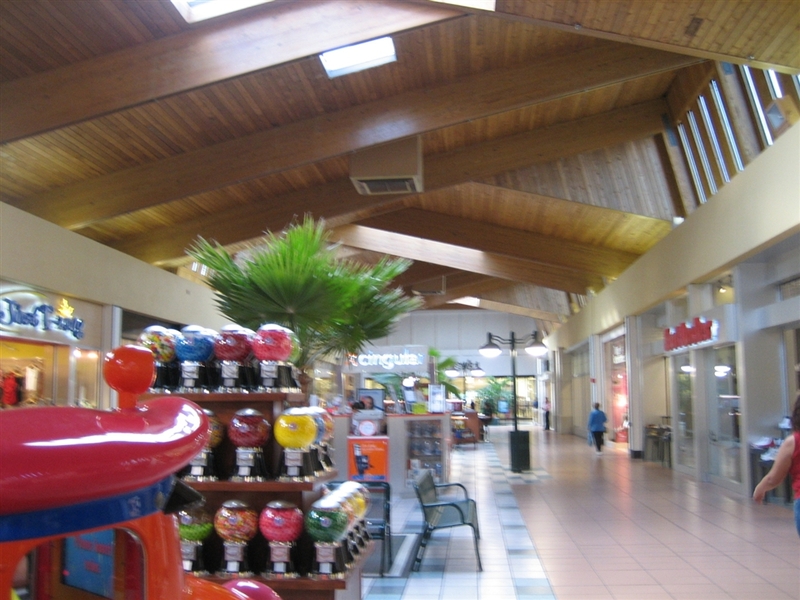 stores and so many skylights to bring in that natural light. That would be a FANTASTIC Labelscar entry, along w/ the Omni. In regards to the question about the wooden ceilings… last time I was there (March of ’09) they were still there. lol, I don’t think they’ll ever get rid of them; They’ve been there since as long as I can remember, probably since the mall opened. Anyway, I could go on about some of the old, long-gone tenants (Picadilly restaurant by Sears) and my personal memories from this mall, but I don’t want to go on and on. I will briefly share one moment though: I was there one time w/ my mother and older sister (when the 2 of us siblings were little kids) and my sis was upset about something and wandered off/ran away. We couldn’t find her for maybe 30 minutes and after calling mall security, friends, etc she was found shaken up in the Sears w/ a salesperson, but unharmed! Luckily it was a relatively small mall. I also remember meeting dates there when I was about 15… mmm, some good times. I don’t go there much anymore. Last I was there was a few months ago to rent a tux for my sis’ wedding. 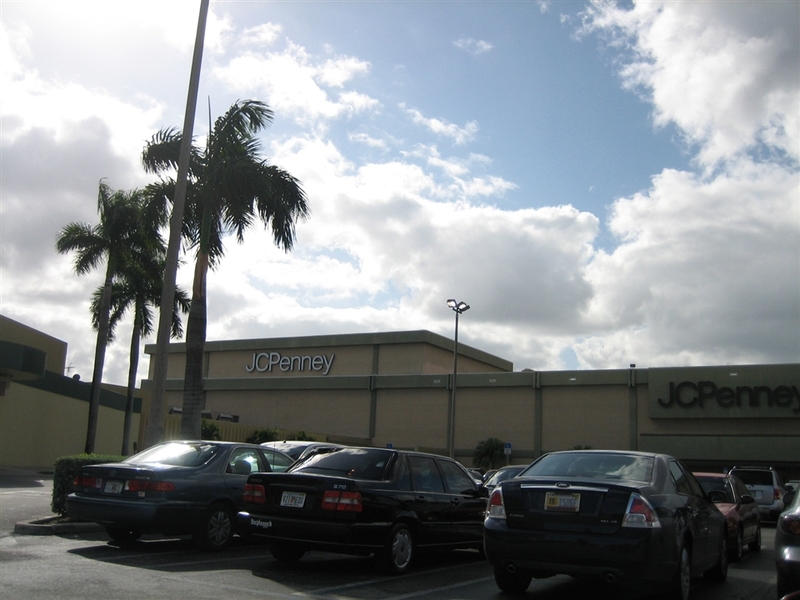 Also wanted to mention another mall in south FL that is not on here (and I wish it was)… it was my FAVORITE property of all-time and a once well-known place for the long-time locals. It was called the OMNI. It was located just north of downtown Miami. I have an article written on it @ another site (not sure if I’m allowed to say the name but you can read up on it on wikipedia.) 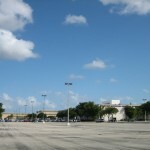 Just google “Omni International Mall of Miami.” You will find a wikipedia article and a link to my article as well. 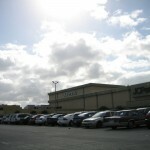 You can mention DeadMalls.com here…the summary came from you…correct? Yes, I was speaking of DeadMalls.com and yes the summary was written by me. I wanted to make some changes to it, since I had some info that needed clarifying/ updating but the website never posted it! Anyway, back to original topic, It was interesting to see Westland on here. 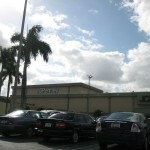 There are so many shopping centers in south FL worthy of being on Labelscar, but I’ve only found a few. 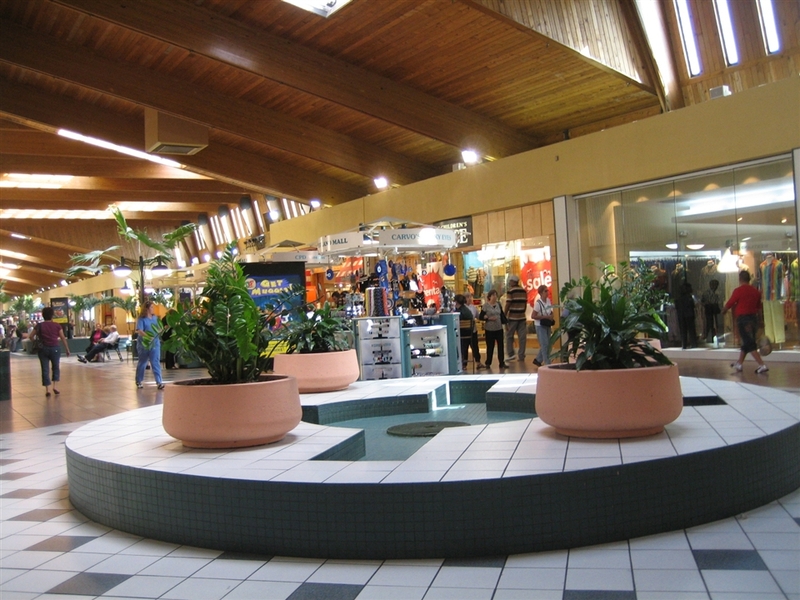 While not quite a dead mall, the old Mayfair mall with the fountains in every possible area, was my favorite mall. The remodel upset me. 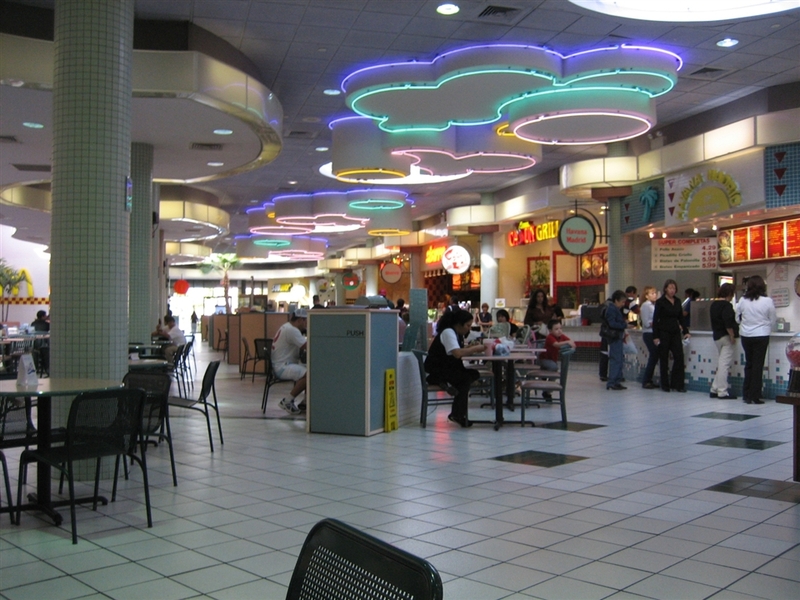 I wish pictures of the original mall would surface. This mall is here to stay till the end of humanity. 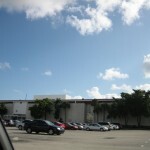 Hialeah is the 5th largest city in the State of Florida, and one of the most dense cities in the country. 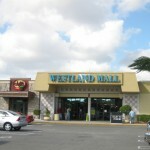 Westland Mall has been an institution for nearly 4 decades now and gone through generations of families. For your average day of shopping for clothes or a quick hangout for the teenagers this mall has mantained that use and nothing can really change that. I don’t get the “Wasteland” comment, during the work week its as busy as a mall gets but during the weekends and the shopping holidays (now during school shopping) the traffic is epic. Theres a famous arial picture from last year where every single parking space is taken and snakes of cars are riding around. Shoppers come anywhere from Pembroke Pines/Miramar area down to the Opa-Locka/Carol City/Miami Gardens area and then theres the Hialeah/Hialeah Gardens/Miami Springs area. People from Broward County show up mainly because of cheaper prices than the Pembroke Lakes mall. 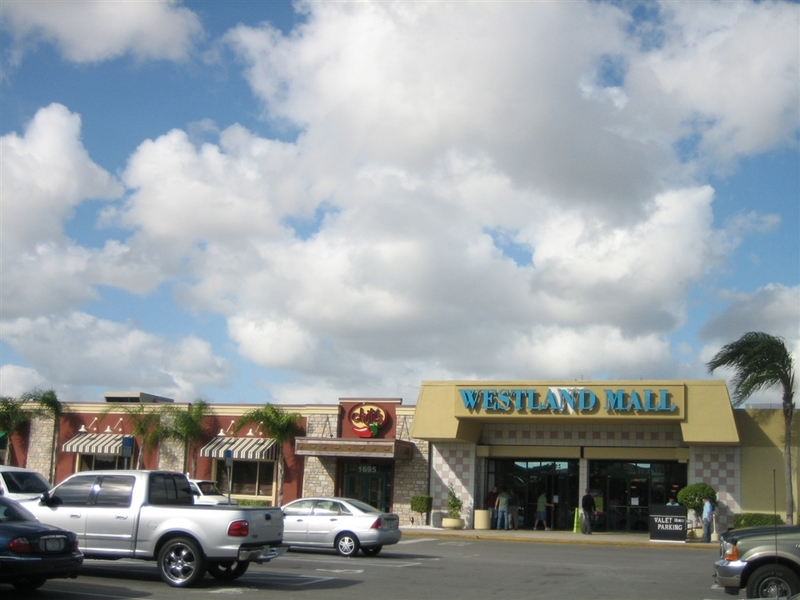 For certian higher end shopping, Westland is not your mall. But the whole Northwest Dade/ I-75 region is Westland’s solid base that will not go away anythime soon. The mall can certianly use some sort of revamp. Right now the parking lot has gtten lots of new trees and little aethetic touch. The exterior was painted some grayish/white color. Inside they have gutted all the fountains and the central platform that held some concerts and events in the past and some trees that surrounded them have also gone. I have no idea what they are planning but it feels a bit empty right now without the seating area with the fountains and stage, hopefully they’re planning something. Yeah, I miss the central platfrom in front of JCPenney! And you’re right, that spot does look a bit empty now. I used to meet people there all the time and would see some live entertainment once in a while. I waited for Westland mall to be built. It was going to be air conditioned and where we usually went to shop,Northside shopping center was not. 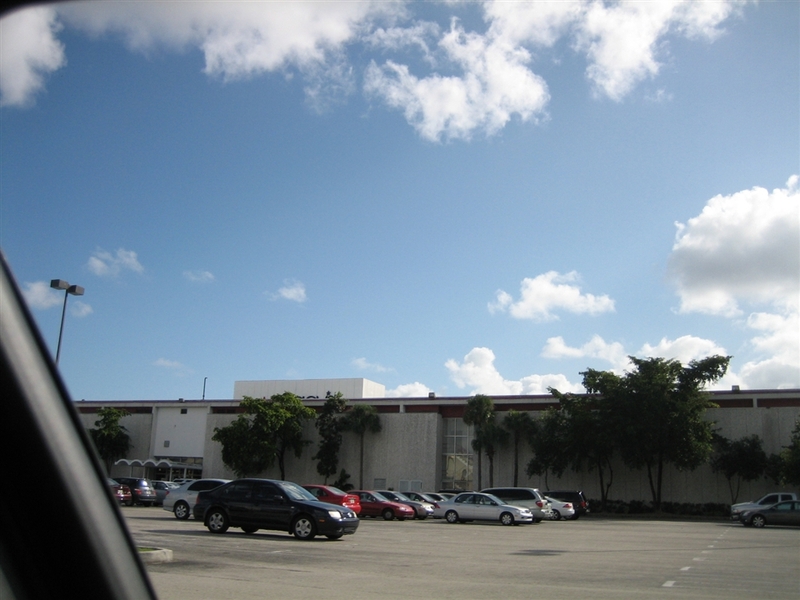 Before the mall was even built I went to Hialeah I went with my Mom when I was a kid, they showed free movies every Tuesday in the day time. All up and down 103rd street there was shopping that we always went to. I couldn’t hardly wait for the mall to be built. After getting married my husband and I bought a house right behind Westland mall it was 1975. A bunch of new modern houses had been built in west Hialeah, and were bought up almost all at once by cuban immigrants. In 1975 when I found myself in need of a job, I decided to go to Westland mall for sure I could get a job there. Wrong, I went into practically every store there and I got the same reason at each for not hiring me. I didn’t speak Spanish. This was in 1975. Hialeah definately didn’t have 92% Cuban residents. It was American operated stores that wanted their business. That’s how it became 92% hispanic. That and the loans they got from our government to buy up all of those houses. Not to mention the loans to start up businesses that catered only to Cubans. The success of Hialeah was already there before the Cuban immigrants arrived. They just took over a city that was already doing well. Does anyone remember “The Door Store”? Before Ikea came along, they were the source for your cheap “retro” looking furniture, And if memory serves me, there was a Door Store at Westland for a while. I miss being there >< i wanna go back to miami! it's a cool mall! hi, i was wondering who i can talk to because i was falsely accused of stealing saturday night by a security guard who chased him down and i came back on monday and they seen me walking and said it was me. i have proof and witnesses from stores that i can prove and alibis that i can show em. ALSO i was at mcdonalds that same night when i seen the security guard chase him down. i got confronted by them and i told them everything that it was not me and i told em i bought some jordans that night and i was carrying a huge white CHAMPS bag but they wouldnt hear it. i wanna make a case of this cause its simply not fair and i love shopping at thayt mall. please contact me if anybody can help at calireyes20@yahoo.com. please and thank you. Thanks for the memories, I grew up visiting this mall in the 80’s and 90’s. Great memories there. I no longer live in South FL but still visit that mall when I go see my family there. It has changed and not for the better, I guess I’m just nostalgic but the 90’s were probably its peak. The stores are nothing special. Yes I remember its old stores throughout the decades…Specs, WB Store, Walden Books, Wicks n’Sticks, The Barefoot Mailman…these stand out in my mind. And yes the platform in front of JCP, the Burdine’s Cafe. 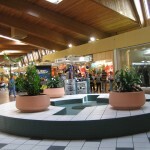 This was the place to be as a teen in Hialeah. Feeling kinda sad actually, visited this place since I was a toddler in the 80’s to when I left FL in the late 90’s. I was at this mall yesterday. It is absolutely PACKED! There is never anywhere to park and it is crowded everytime i go in there. It’s certainly not the nicest mall, but Westfield has been working hard to reimage it. New tiling has been put in along with a new mall logo and entrances. 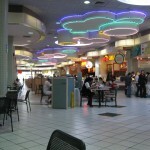 Food court even has some new restaurants.